Beyond Hong Kong's towering skyline and ship-filled harbor, the Kowloon Peninsula gives way to the verdant hills and peaks of the Chinese mainland. The bustling international business center is a natural gateway to an area that has experienced phenomenal postwar growth and dynamism. Despite recent financial turmoil, there is no denying how far the Asia-Pacific region has come - and how promising its future remains. Camille Tang Yeh (MBA '80) is acutely aware of the region's potential. As executive director of the Hong Kong­based HBS Asia-Pacific Research Office, she has been charged with coordinating the School's ambitious research efforts in a daunting list of culturally diverse countries such as Australia, China, India, Indonesia, Japan, Singapore, Taiwan, Vietnam, Malaysia, and Pakistan. Officially opened last October, but inaugurated with a festive dinner in January, the office demonstrates "the depth of the School's commitment to building intellectual capital in the region," says Yeh. The former investment banker and longtime Hong Kong resident has already welcomed several faculty members to this "home away from home" in the Bank of China Tower, which HBS researchers can use as a base of operations for work in the twelve countries in the region. Yeh and her small staff are set up to provide a significant part of the intellectual and logistical support needed by visiting HBS scholars. Yet logistical help is not the main reason for setting up the Asian outpost. The office is part of the HBS Global Initiative spearheaded by Dean Kim B. Clark to ensure that the School fosters a global culture in its curriculum and programs and instills an international outlook among its students. 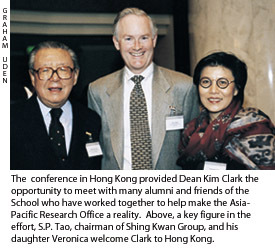 Even though HBS faculty have been active in Asia for decades, "This is the beginning of a new phase," said Clark at the opening dinner, which was attended by Hong Kong chief executive Tung Chee-hwa and over two hundred alumni and friends of the School. "Our research and teaching are fundamentally grounded in and connected to the world," said Clark. "We hope that this will be an intellectual center that will stimulate engagement." Underscoring just what Clark meant by engagement, HBS convened a two-day research conference to coincide with the office's January inauguration. By bringing together nearly sixty business and management academics and about twenty CEOs and managers from across Asia, the forum provided an opportunity for HBS professors working on Asia-related research to present their work in progress and exchange views with colleagues and practitioners. The event's overriding message, according to organizer Karen Wilson (MBA '91), executive director of the HBS Global Initiative, is that the School is open to new ideas, new technology, and new ways of thinking. More research centers will follow, with the next one likely to be opened in South America. "We're in the midst of profound changes that will be of lasting consequence," said Clark at a luncheon address to participants. "Long-established paradigms are now becoming inadequate. As we think about our mission to educate leaders, we are driven by a strong belief that to prepare managers well, we have to change. What we're doing in Asia has grown out of that belief. We need to create new intellectual capital to underpin our goals at HBS. Thus, we must deepen and extend the quantity and quality of research in Asia and the world." The value of building wider connections became even clearer on the afternoon of January 7 when conference delegates sat down after lunch in the ballroom of the harborside Grand Hyatt Hotel. Calling the brainstorming session to order was conference chairman Professor Robert H. Hayes, a key figure in the development of the new Asia-Pacific Research Office. As the HBS faculty increases its activities in Asia, the School must stay in touch with academics and practitioners who live there, Hayes observed. "Perhaps in the process of getting to know each other better," he said, "we can also facilitate the building of closer relationships among those of you who - like our faculty - come from many diverse countries. The issues facing Asia today are too big and complex for any single person, university faculty, or company to comprehend fully. Making progress in the Asia-Pacific region will require the cooperative efforts of many of us. This will contribute to the future prosperity of the region." Hayes's remarks were something of a starting gun that set the assembled minds racing. As HBS faculty took the floor in succession, participants freely contributed comments and suggestions for additional research, drawing parallels with their own work or experience. A case in point was HBS professor Rohit Deshpandé's presentation, the first on the agenda. He reported on the initial results of a multination study of factors driving business performance in Asia. His findings were based on data gathered from interviews with senior executives at about five hundred major companies in China, Hong Kong, India, Japan, Thailand, and Vietnam. Deshpandé and his team discovered that many of the "strategic levers" essential to high performance in Asian firms were identical to those found in a separate study of companies in Western countries. But while innovation was the most important driver of high performance among the corporations in the Western economies, in Asian companies the key element was how customer-oriented firms were. 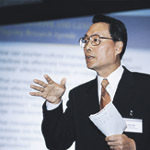 That prompted computer entrepreneur Stan Shih, cofounder and chairman of Taiwan's Acer Group and a pioneer Asian brand-builder, to raise his hand. (Throughout the conference, Shih was a case study of the dynamic CEO: when he wasn't in his seat listening attentively or in front of the audience imparting wisdom, he was in a corner whispering into his cellular phone.) In Europe and the United States, he said, "they have already reached a threshold in customer orientation, so you have to do different things to succeed." That's not the case yet in Asia, he pointed out, as Deshpandé listened intently. HBS professor Paul M. Healy spoke on the role of accounting and auditing standards in China, while Associate Professor Huang Yasheng closed the first session with a detailed briefing of his ongoing study of foreign-invested enterprises on the mainland. The afternoon concluded with an open discussion at which many other academics described their research. There were special pleas, too. Ehsan-ul Haque of Pakistan's Lahore University of Management Sciences cited an overemphasis on policy-driven studies at Asian institutions. "The immediacy and urgency of decisions [on policy] are so great that we cannot afford the time for more rigorous research," he said. Jacinto C. Gavino of the Asian Institute of Management in Manila suggested that, given such constraints, there should be an evaluation mechanism developed to help focus research on the most important issues. Other participants also remarked that the Asian economic crisis called for a reorientation of research priorities. Although the breakup of large conglomerates or chaebol is now a hot issue in South Korea, said Chang Sea Jin of Korea University's School of Business Administration, little research has been done on them. Hideki Yoshihara of Japan's Kobe University argued that too much academic attention had been paid to Japanese success stories, but not to the limitations and failings of his country's other companies. "It's not enough to do research on the 'can' aspect of Japanese management. There must also be work on the 'cannot' aspect," he said. "We have difficult problems, so this is a good time to do research." 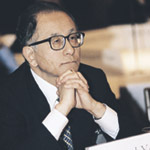 Yoshihara's concerns were echoed by Hotaka Katahira, an economist at the University of Tokyo. Years of economic stagnation and generational shifts mean that previous assumptions are quickly becoming obsolete, Katahira noted. "Japanese consumers and the concept of consumer satisfaction are changing," he said. "We need to redefine the model of customer behavior in Japan." But perhaps the most telling comment came from Trilochan Sastry of the Indian Institute of Management. 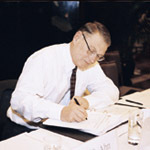 While noting that HBS-generated research, case studies, and management thinking have "tremendous influence" around the world - possibly more than the School itself realizes - he doubted whether principles and ideas applicable to U.S. companies could always be "taken out of context and dumped into completely different firms" elsewhere. In developing economies, such as India, Sastry reasoned, "we have to reexamine the fundamental assumptions of what makes a good firm." It was a reminder that what's right for America may not make sense in Asia - an obvious point, perhaps, but one worth repeating in any forum on cross-cultural issues. The second day of the meeting produced equally profitable exchanges. HBS professor Christopher A. Bartlett discussed changing Asian management practices, using Acer as a case study. Stan Shih, who serves on the HBS Asia Advisory Committee, stepped up to share his thinking on a major corporate reengineering he is currently conducting. Other highlights included HBS professor Lynn Paine's presentation on global business values, assisted by special guest Zhang Ruimin, president and CEO of China's Haier Group, a maker of appliances; a briefing by HBS assistant professor Walter Kuemmerle on global research and development networks; Professor Krishna G. Palepu's and Associate Professor Tarun Khanna's thoughts on the restructuring of businesses in emerging markets; and Professor Dwight B. Crane's examination of the Asian financial crisis. The sweeping exchange of ideas prompted Professor David B. Yoffie, conference cochair, to conclude: "There is a need to look for ways to blend Asian and Western approaches." The studies presented in Hong Kong demonstrated why, as Professor Michael Y. Yoshino, HBS director of Research, put it, "the School is a unique place with a unique mission." The School's business, he said, is "creating and disseminating knowledge." And he added: "We seek to contribute not just to business scholarship but also to the practice of management." He noted that when he first joined the faculty nearly thirty years ago, there were only four non-U.S. nationals, including himself, among his colleagues. Now, the cadre of researchers and teachers at HBS reflects the multinational character of the student body. In course development and case-study coverage, "HBS has a strong commitment to international research and the internationalization of the curriculum," Japan-born Yoshino said. Asia, Yoshino explained, provides an interesting platform for the School's research. "Here, we can test our findings, knowledge, and theories developed elsewhere, as well as define new hypotheses that can be tested in other areas. We haven't just discovered Asia today, but we do need to strengthen our presence and increase our capabilities in this region." A key challenge is to cultivate access and connections to corporations in the region in order to develop case studies. "We must win the confidence of major companies in the region," Yoshino said. The Hong Kong Research Office with Camille Tang Yeh in charge is already working hard to do just that. "In our attempts to contribute to management understanding and practice in an increasingly global marketplace," remarked Bob Hayes, "we cannot rely solely on the expertise of specialists in a particular region of the world. All of our faculty need to build strong area expertise. "Much of the recent attention Asia has received has focused on its current problems, rather than its enduring strengths," he continued. "We steadfastly believe that Asia has a bright future and hope to be able to contribute to the rethinking about corporate management in the region." 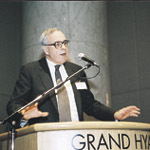 Speaking at the dinner that capped the research conference, Professor F. Warren McFarlan, a veteran faculty member who is now overseeing the operations of the Asia-Pacific project, predicted its impact will be far reaching: "This will be a deeply transforming period for HBS," he observed. The conference provided a chance for HBS to recognize the enthusiasm and support of many alumni and friends throughout Asia, particularly S.P. 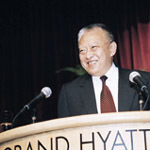 Tao, chairman of Shing Kwan Group, who not only provided the School with office space in the Bank of China Tower but has also initiated a major new fellowship program to enable young, entrepreneurial Chinese students to attend HBS; former HBS faculty member and longtime friend of the School Victor K. Fung, chairman of the HBS Asia Advisory Committee; and Singapore's Minister for Information and the Arts George Yeo (MBA '85). 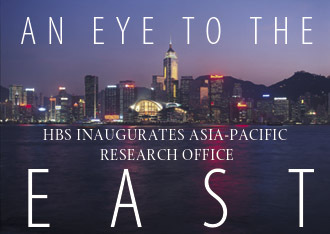 "We are absolutely delighted and honored that HBS has chosen Hong Kong," said Tung Chee-hwa, Hong Kong's chief executive, at the inaugural dinner. 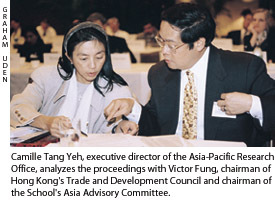 Fung added, "HBS's choice of Hong Kong gives us incentive to build Hong Kong's resources as a center of learning. Never before has there been such a need for a top-flight research center." In a final speech to the group, George Yeo praised his alma mater's bold bid to expand. "If an institution stops changing, it dies," he said, hailing Dean Clark as the "leader of the quiet revolution to prepare the School for the next century." In response, Clark declared: "The Asia-Pacific office is something we have dreamed about and worked hard for. HBS is going to be a global institution. We have taken the first few steps. It starts today. It starts here."